The Find X has a 6.42-inch AMOLED display with a Full HD+ 2,340 x 1,080 (~401ppi) pixels resolution and a 19.5:9 aspect ratio. 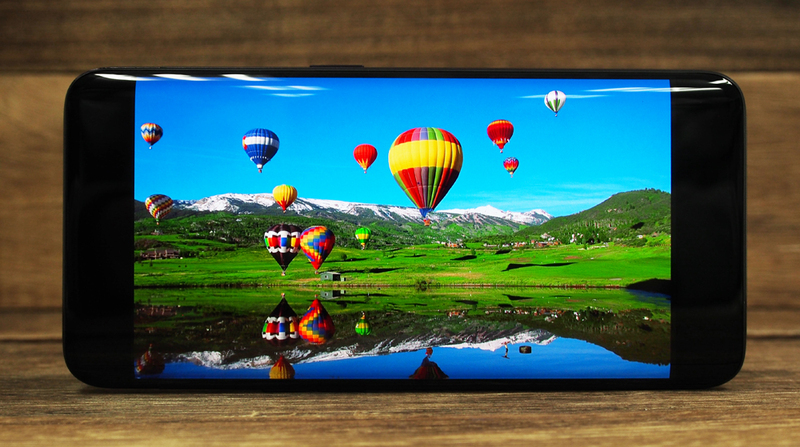 The display is vivid and bright, with great contrast, deep blacks, and wide viewing angles, but its huge size is really deserving of a higher resolution. When compared to other large phones like the 6.4-inch Samsung Galaxy Note9, there's a discernable difference in clarity. According to Oppo, the display is HDR10 compatible, but I had trouble getting it to display HDR content on both Netflix and Amazon Prime Video. One other thing you'll find on Samsung's Super AMOLED displays, but not on Oppo's AMOLED display is the brightness overdrive mode when exposed to bright light. The Find X screen looks great indoors, with a maximum brightness of 430 nits, but it can't go beyond that outdoors, and the screen is quite hard to see under bright sunlight. Unlike Samsung's Edge Panels software, Oppo doesn't offer much extra functionality to make use of the curved edges of the display, although there is an option to turn on a "curved panoramic light effect' which displays a pulsating color across the entire edge of the display when you have an incoming call or lockscreen notification. There's an Always-On Display option for the phone, but it's off by default and buried in the settings menu. To turn it on, enable the "Screen Clock" option in the Display settings. Screen Clock will show the time and date, as well as notifications like missed calls and unread messages. Oppo has teamed up with Swedish audio experts Dirac to develop software optimization for the Find X called 'Real Original Sound Technology'. This feature only works with headphones connected and is essentially an equalizer with some pre-configured presets for various genres. You can also customize your own settings. Audio sounds pretty good through the bundled USB Type-C earphones (which look identical to Apple EarPods by the way) but isn't as impressive through the single on-board speaker. The on-board speaker is fairly loud, and has a reasonable amount of bass, but pales in comparison to anything with stereo speakers. If you prefer wireless audio, the Find X supports a wide range of Bluetooth codecs, including SBC, AAC, aptX, aptX HD, and LDAC. The Find X runs on Android 8.1 Oreo with Oppo's ColorOS 5.1 on top. As usual, ColorOS bears more than a passing resemblance to iOS, with the app drawer removed, and apps sitting instead on the homescreen itself. New features in ColorOS 5.1 include new app shortcuts, which let you long press an app to display a small menu of quick launch shortcuts (basically Oppo's version of 3D Touch), redesigned icons and themes, O-moji (yes, they're Oppo's version of Animoji), new AI features including real-time translation, and new navigation gestures. Just like Apple and Samsung, Oppo has its own 3D face mapped emojis. Oppo's version is called O-moji and works pretty similar to Apple's. There are 12 animals to pick from, including a penguin, pink hippo, and a lion with a fabulous pink hairdo. Alternatively, you can create your own O-moji by taking a selfie and then customizing an array of options. You can access your O-moji's via the camera app, then insert them as stickers into any messaging or social media app. Oppo's improved AI software claims to build on user behavior models for faster app launches and better resource management. We've seen this before in many other phones with varying levels of success. The AI engine also uses this behavior to show relevant information on the left-most homescreen pane - calendar appointments, quick shortcuts, weather, world clock, package tracking, flight info, among others. You can also manually configure these if you prefer. Oppo has redesigned its gesture controls for the Find X. You now have an option to turn on 'Swipe Up Gesture' navigation, which basically copies the gesture model on the iPhone X. Turning it on will position three small lines at the bottom of the UI (although you can also choose to hide these). By default, swiping up from the middle line acts like a home button but if you stop on the screen mid-way, you'll open the recent apps menu, just like on the iPhone X. Swiping on either the left or right lines acts as a Back button. Alternatively, you can change the layout so that one line goes back, and the other opens the recent apps menu; this is a much better layout. There are also two gestures you can activate that only work on the curved edges. Swiping twice across an edge will switch you back to your previous app, while swiping in opposite directions across both edges will open split-screen multi-window. One last thing to take note of is that, like many Oppo phones, the Find X lacks NFC support, which rules out most mobile payment apps. This isn't as big of an issue on Oppo's more affordable phones, but you really expect a S$1,199 phone to at least have NFC.